← Well look who’s here! I’ve done a little interview with Miss Print which is up today. I encourage y’all to go read it, and thank you so much for your enthusiasm, Miss Print! 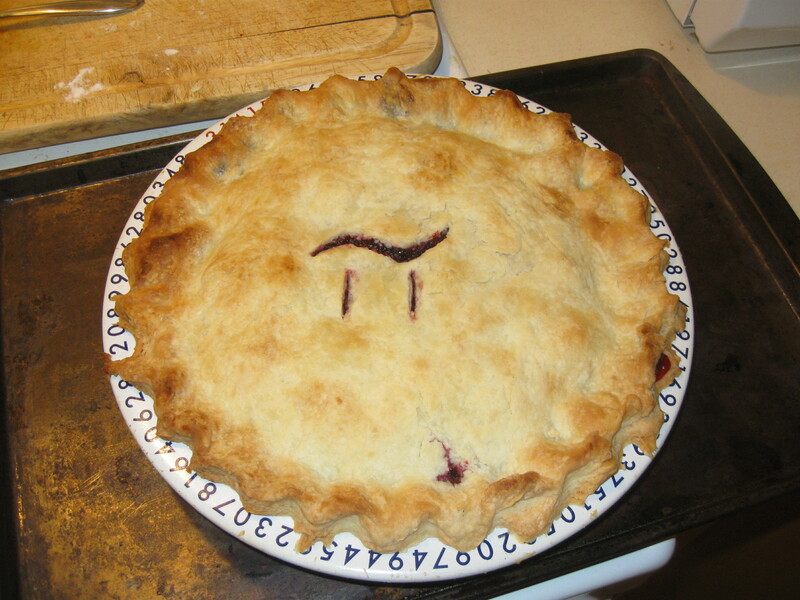 Today being, as it were, Pi Day, I have committed to making a pie. Why? Because I am home and have time. I admit, part of me is rebelling very slightly at the tyranny of numbers. The other part of me really likes pie. It shall be blackberry. Blackberry is its own reason and its own reward, surely. Updated to add: PIE, darlings. Blackberry? At this time of year? When do things like blackberries come into season in BC? LOL, I’m amused that you’re both worried about the same thing. These are wild blackberries that we picked and froze (in convenient pie-sized quantities) back in August. WE ARE PROFESSIONALS! We had a pie day at school today. I made a peach pie. Maybe the snow will take the hint and go away. We had Pi(e) day at school today too! There was a pi-reciting contest, and my friend won, with 433 digits. And of course, everyone got a slice of pie. I got blackberry. No, cornbread are squared! Pie are round! Isn’t the REAL Pi Day supposed to be 3/14/15 at 9:26:53 am? Well, that’s a damned fine pie SECOND, perhaps the best of the century! But I’m hanged if I can figure out how to eat a slice or two of pie in one second. I’ll stick to the full pie day, thanks. Now we’re really splitting hairs!